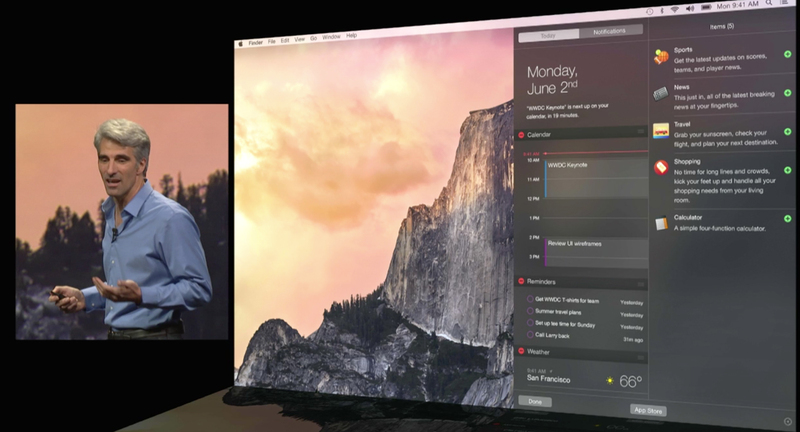 Apple(s appl) revealed OS X 10.10 Yosemite, the next version of its desktop software, at its annual WWDC on Monday (follow our liveblog here). The new operating system comes with a complete visual overhaul, with a new interface, major improvements to Apple Mail and iCloud, and a feature called Continuity that lets Macs and iOS devices interact. Like OS X Mavericks, it will be free. Three changes a OS X user will immediately recognize are the icons, the typeface, and a whole lot of translucency. The translucency is meant to add a sense of depth and place in the desktop, similar to how iOS 7 added layers to mobile operating systems last year. There are a lot of visual changes that add up to a shared design language between OS X and iOS. iCloud Drive has received a few major improvements. In Yosemite, the Finder window will gain iCloud Drive folder on its left toolbar. iWork documents are automatically saved in that folder, but other documents can be saved in that folder and iCloud will sync those non-iWork files across devices. According to Apple VP Craig Federighi, it will work on Windows as well, which makes it into a direct Dropbox competitor. One of the best new features involves sending large attachments through email. Apple calls it Mail Drop. If you’re sending a large attachment through Apple Mail, it will be separated, encrypted, and uploaded to iCloud. If you’re sending the email to another Apple user, they’ll see it like a standard attachment, but if they’re using another email service, the email will have a link to download the file. This feature fits in nicely with Apple’s new user drawing and highlighting tools called Markup, which appear to be a few editing features built into Mail.app. The file size limit for Mail Drop and Markup is a whopping 5GB. Spotlight was updated with a lot of new information covered under search, such as contact information, maps, photos, and even reviews from Yelp. Spotlight can even provide a small Wikipedia excerpt. For a good number of searches, Spotlight might more sense than Google. Spotlight is also integrated into the Safari URL bar, which no longer simply searches Google but also adds options from the local machine. Safari also gets a new tab view which sorts pages into stack, and a new sharing function. One of the biggest new features on OS X Yosemite is called Continuity and allows a Mac to talk to an associated iPhone. If the iPhone and the Mac are on the same Wi-Fi network, users can even pick up phone calls on the Mac. iMessage on the Mac will even display SMS texts. OS X Yosemite is free and available to developers today and everyone else in the fall. Sounds just like Windows 8 to me: iRevenuePathControl. What devices can you update OS X Yosemite on?